The company has announced a range of plug-in hybrid powertrains for its larger models as part of an expanded electrified range. The brand said it would now reserve the e-tron name, previously used on plug-in hybrid models, for fully electric cars and the latest range of PHEVs will instead go under the new ‘TFSI e’ banner. 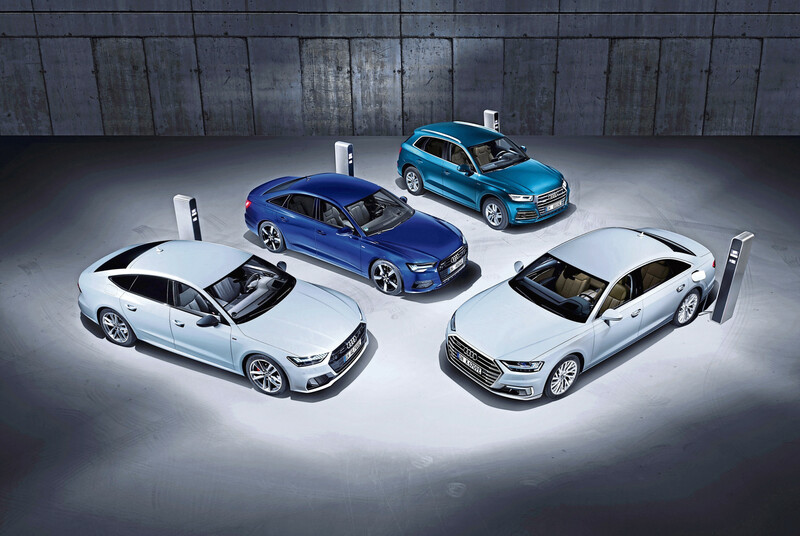 Far from being token hybrid models, the A6, A7 and Q5 will offer a choice of two hybrid powertrains and will be badged as either a 50 TFSI e or 55 TFSI e – for ‘comfort’ and ‘performance’ respectively. They all mate a 2.0-litre, four-cylinder turbocharged petrol engine to an electric motor mounted to the dual-clutch gearbox. The 50 TFSI e models will produce 295bhp and 450Nm of torque, while the 55 TFSI e models will up this to 362bhp and 500Nm of torque. All use a seven-speed gearbox. The cars’ lithium-ion battery sits under the boot floor. Its 14.1kWh capacity will provide at least 25 miles of pure-electric range, according to WLTP test data. 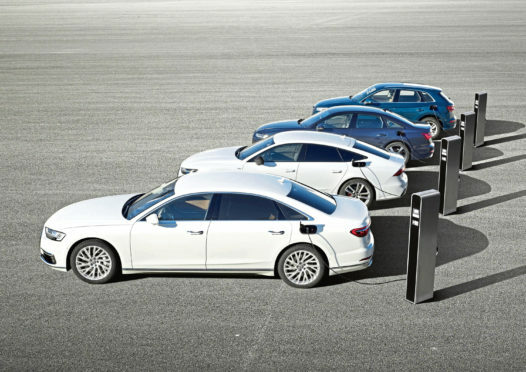 Audi says the battery can be fully charged in around two hours from a high-output 7.2 kW charger. The A8 limousine, being a rather higher-class machine, doesn’t make do with a mere 2.0-litre four-cylinder. Instead, it uses a 3.0-litre V6 married to an eight-speed gearbox and is badged as a 60 TFSI e. Total system output is an impressive 443bhp and 700Nm of torque. All four models use the brand’s famed quattro four-wheel-drive system, as you’d hope from a premium Audi. It’s a big year for low carbon cars from Audi. The German company has just launched its first all-electric vehicle, the e-tron. The electric SUV has a 249 mile range – a bit down on the 292 miles offered by the Jaguar iPace – and costs from £71,490, with an all-bells and whistles Launch Edition weighing in at a heftier £82,240.